Huge range including over 450 000 primary antibodies and 5000 secondary antibodies. From the biggest leading brands to the most specialized ones through a unique point of contact. Dedicated Search Engines : Prim’Ab search and Ab2 search. Compare the major specifications of antibodies at a glance and directly access to technical datasheets. Customized search. You’re not finding the antibody you’re looking for? You don’t want to waste time for searching it ? Simply ask us! Our scientific team will find it for you and offer the best value for money by sourcing it at the root. "Minimize risks". 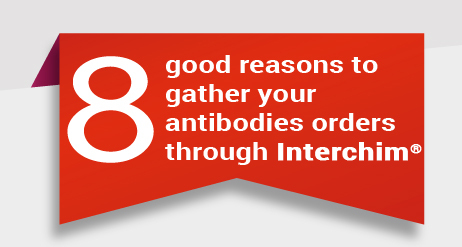 You want to try one of our antibodies on untested species or applications? Use our program "Minimize the risks" ! > 12 000 sample sizes (primaries and secondaries) negociated from our suppliers. Find them easily using our search engines. Scheduled Promotions. FREE SAMPLES! at this time !